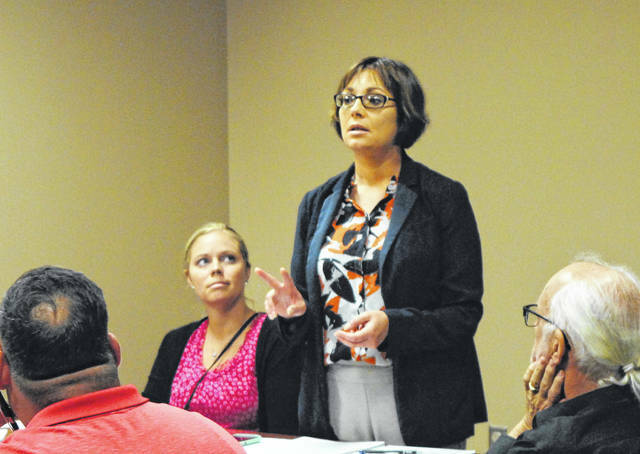 Highland County Prosecuting Attorney Anneka Collins, standing, speaks to members of the Highland County Drug Abuse Prevention Coalition on Thursday. Also shown is Assistant Prosecuting Attorney Molly Bolek, seated at left. Collins said the issue is not a house bill or change to state law, but a change to the state constitution, “right next to the right to keep and bear arms.” The prosecutor said it would be extremely difficult to reverse if it is approved. According to Collins, Issue 1 aims to reduce mass incarceration in Ohio and use the savings to expand drug treatment options for more of those addicted. But, Collins said, since the issue removes consequences for not reporting to court-ordered treatment programs, it will result in fewer people completing treatment programs that are already in place. “It’s not going to help with treatment,” she said. Collins said the issue reclassifies fourth- and fifth-degree drug possession felonies as misdemeanors, which makes shoplifting a DVD from Walmart more of a crime than carrying enough fentanyl to kill nearly 10,000 people. The prosecutor said those who commit those crimes cannot be sent to prison until they’ve committed them three times. “Let’s just hang a sign in Ohio that says, ‘open for business,’” she said. Collins also said Issue 1 includes an administrative 25-percent reduction for many prison sentences, which she said will result in “a flood” of offenders coming back to Highland County to commit more crimes. The prosecutor said offenders serving prison time for felonies that are reclassified under Issue 1 could be automatically released as well, depending on the particulars of their case. “There’s no input from a judge, no input from a victim,” she said. According to Collins, the issue has been approved in California and Oklahoma, and there are efforts in both states to repeal it due to the problems it has caused, specifically related to released inmates re-offending. Collins said the issue also strips judges and prosecutors of the authority to send offenders to prison or treatment based on the details of the case. The prosecutor said judges sometimes need to send offenders to prison as “a wake up call,” if they do not respond well to second chances. Collins added that if a low-level felony offender is placed on probation, they can’t be sentenced to prison for violating the terms of their probation unless they commit a new felony. The prosecutor said that means offenders can get drunk or harass victims without consequences. According to Collins, about 4,000 people are sentenced to prison for probation violations that were not new felonies. Collins also rebutted claims that the amendment will be a cost savings to Ohio due to decreased incarceration. The prosecutor said the issue will result in higher incarceration rates in local jails, putting a greater financial burden on local governments. “How is that a savings?” she asked. Collins said the issue will also keep prosecutors and law enforcement from using confidential informants to make undercover drug buys, since most informants cooperate because they have prison time hanging over their head for low-level felonies.